(Newser) – Disturbing images of the Gulf oil spill have caused California Gov. Arnold Schwarzenegger to change his mind about allowing new drilling for oil off the California coast. The governor withdrew his support for a project expected to raise $100 million for the cash-strapped state, telling reporters: "If I have a choice between the $100 million and what I see in the Gulf of Mexico, I'd rather figure out how to make up for that $100 million." 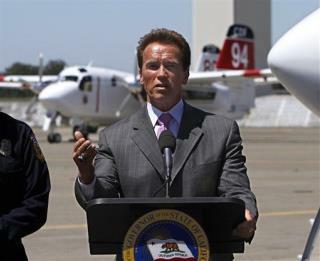 Schwarzenegger's U-turn on the project—which his administration backed as recently as last week—almost certainly means that the first new drilling in state waters for 40 years will be canceled, notes the San Francisco Chronicle. Texas Gov. Rick Perry, meanwhile, says he's still in favor of new offshore drilling. Perry labeled the spill an "act of God" and warned against any "knee-jerk" reactions, reports the Fort Worth Star-Telegram. Arnold is over reacting here, certain people are having a knee jerk reaction and yet others are politicizing this! We need the oil and the jobs it brings. I grew up in south Louisiana. The people there love the oil industry and the offshore jobs that come with it. It's long been a boon to the economy. I can guarantee almost no one who lives there is against offshore drilling. They see this as an unfortunate accident that needs to be cleaned up as best as possible, but let the drilling continue. And I agree that Calif. and probably Florida will have knee-jerk reactions. Rather than outlaw offshore drilling. Place a moratorium on new drilling. Make safe guards that shuts off the flow of oil. The valves on this platform is not working. They cant be shut off. New technologies that work under the harsh environment they exist in must be thought up. An inspection by an official at determined intervals must be done if the platform is to keep working. We need that oil, we just have to be smarter about getting it out.